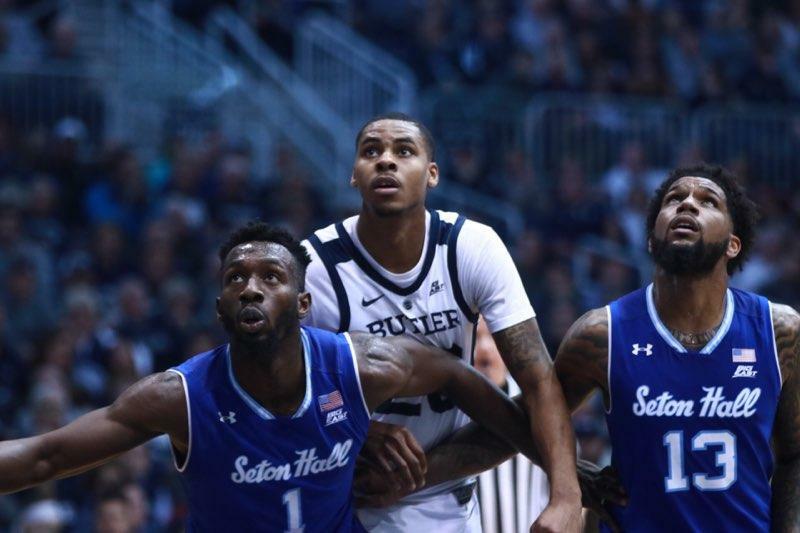 Henry Baddley battles for positioning against Seton Hall. Butler moved to 4-6 in Big East play with the win. Photo by Jimmy Lafakis. The Butler men’s basketball team got back in the win column with a 70-68 victory against Seton Hall at Hinkle Fieldhouse. Butler took a 12-point lead into halftime but the Pirates rallied to tie the game in the final minute. Here are three takeaways from a terrifyingly close win. 1. It’s amazing what happens when threes go in. Butler took 25 threes in this game, one less than it attempted against Marquette. Instead of starting 1-of-11 like they did last time out, the Bulldogs connected on six of their first eight 3-pointers. The result was nine threes, 10 assists and 46 points at halftime. Nothing really changed in terms of Butler’s offensive approach other than shots falling at a rapid rate. All this performance did was reinforce the fact that the Bulldogs are a one-dimensional team on offense. A staggering 47 percent of Butler’s field goal attempts came from beyond the arc. The Bulldogs went 12-of-25 from deep, but they still haven’t proven they can consistently create offense in other ways. Seton Hall won the points in the paint battle, 38-22. Butler got to the free throw line three times in the first half and 10 times overall. The Bulldogs were due for an explosive shooting night, which they certainly got. Getting back to .500 in the Big East will require winning a game or two when the threes aren’t falling. 2. Butler got back to basics and executed the gameplan, for a while. The Bulldogs committed at least 11 turnovers in five of their six previous games. It took over nine minutes for them to record their first against Seton Hall. They turned the ball over five times in the first half, two of which were offensive fouls LaVall Jordan will happily live with. Hitting threes certainly helped, but the Bulldogs also got multiple dunks and layups in the half court, a rare occurrence in their first nine Big East games. Defensively, Butler did a solid job on Miles Powell, who dropped 31 points on the Bulldogs the first time these teams met. He picked up his second foul less than 10 minutes into the game and scored two points in the first half thanks in large part to Paul Jorgensen. Then Powell erupted for 19 second-half points on 7-of-13 shooting and Butler stopped moving the ball. The Bulldogs had a mere three assists after halftime. All the excellent work the Bulldogs did in the first half was almost undone by a lack of execution down the stretch yet again. At this point though, getting the win is all that matters. 3. The bench was unbelievable. In the first half, Butler’s reserves outscored its starters by four, Seton Hall’s bench by 18 and lost to the Pirates’ starters by two. Jorgensen went 4-of-6 from three and Nate Fowler posted a season-high 15 points. All told, the Bulldogs’ 36 bench points accounted for 51 percent of the team’s scoring. Even with Kamar Baldwin and Jordan Tucker contributing only 17 points between them, Butler posted more points than it did in its last two games. The reemergence of Jorgensen is the single most significant development that took place in this win. He’s now reached double-figures in two straight games after failing to in 10 of the prior 12 contests. With Tucker’s place in the starting lineup seemingly solidified, Butler could really benefit from Jorgensen becoming an explosive scorer off the bench again. The Bulldogs just won a game in which their starters were outscored by 27. While it’s not realistic to expect the bench to be this good every game, Butler’s ability to turn things around could very well hinge on what the bench, and particularly Jorgensen, can provide.